family legend has it that Beulah’s grandson Willy complained to his mother that older brother Bobby was “wasting the cookies on the company.” Beulah’s daughter Annie would make these for her grandson Luke during his first year of college and send them in the mail. Luke, missing his grandmother requested these for his 22nd birthday (2014). 1/2 teaspoon cream of tartar. roll in Saran Wrap (one of Beulah’s sponsors); store in refrigerator. slice and bake at 400 degrees about 8 minutes. note: Annie would wrap in wax paper (or plastic wrap) in the rough shape of a one pound butter carton, squish into the carton and refrigerate. one batch fits in perfectly. slice and bake as desired. may be frozen. stir until well blended. pour into heated and oiled iron corn stick pans or oiled muffin tins or loaf pan. bake 15 minutes at 400 degrees. all buttermilk and maple syrup in place of sugar. TOPIC was a sponsor and recipe changes made to include sponsor products. roll 1/8″ thick using enough flour to keep dough from sticking. cut in 1/4″ strips, drop in salted boiling water. cook from 8 to 10 minutes. drain. place in individual (oiled) casseroles, top with grated Parmesan cheese, paprika and butter. heat in hot oven (500 degree F) or under broiler until brown. The wealth of splendid contributions contributed by Holden housewives so inspired another Missouri editor that she decided to incorporate this feature every week in her paper. After getting all details from the local editor a Kitchen Kabinet was installed and it has proven an invaluable addition to that splendid paper. From time to time it has used with credit the contributions of local cooks. 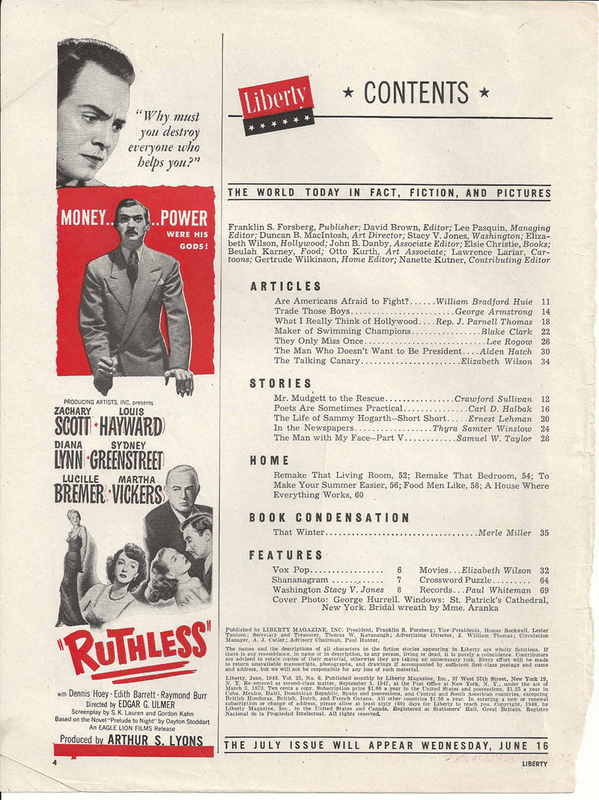 And though you may not have known it the recipes you contributed may have appeared in at least three weekly papers that often use Corner recipes. This week the Corner is making the most of a really splendid department from the Kahoka Gazette. You will recognize the timeliness of the Tiny Beet Marbles that will serve as attractive garnishes for winter salads, chili sauce, beet relish, succotash, stuffed green peppers and canned vegetable soup. With cooler weather here you can put up this food joyously wand with the realization that you are saving quite a few pennies while you use the surplus from your summer’s garden. Do save every one of these; for they are truly worth it. Bring these ingredients to a boil, then reduce the heat and drop the beets into the sirup and allow them to heat through; do not boil them. Pack the beets into hot sterilized jars and seal. Allow them to stand for 2 days before using. Wouldn’t those be nice as garnishes for winter salads? Scald the tomatoes and peel and cut them into thin slices. Next chop the onions and peppers. Cool thoroughly. Add sugar, vinegar and spices. Simmer, stirring frequently until thick. Can in clean, hot jars and keep in a cool place. Put cabbage and beets through grinder. Stir in the other ingredients. Cover and let stand over night. Next day heat to boiling point slowly and seal immediately. Method: Mix dry ingredients, mix and add wet ingredients in bowl, add dates and nuts (floured). Put in greased pan and bake in moderate oven 40 minutes at 350 degrees, reduce last 10 minutes to a slower oven (300 degrees). 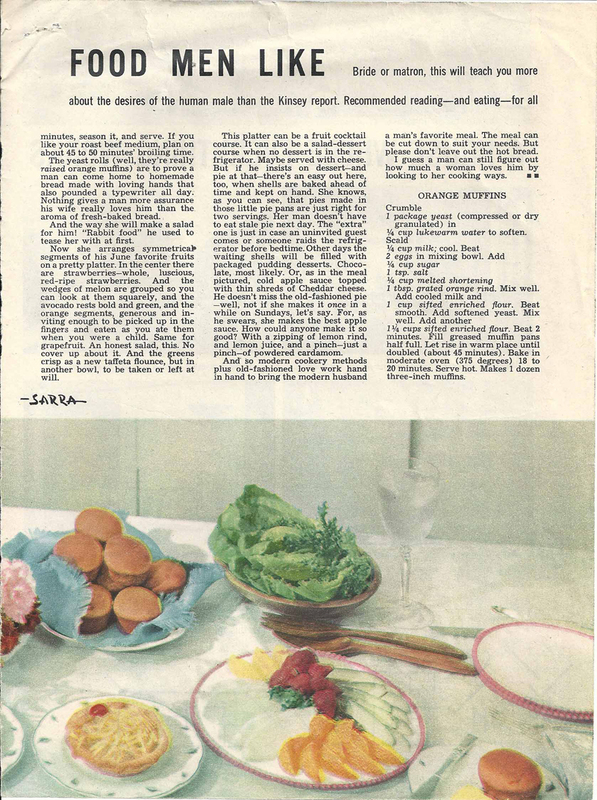 David Brown hired Beulah to be food editor of Liberty Magazine when he took over as Editor. Beulah often talked about David Brown who married Helen Gurley Brown of Cosmopolitan fame. A magazine I read religiously as a teen and twenty-something. Reading this article titled Food Men Like brought to mind those tantalizing quips on the front of Cosmopolitan every month and how Beulah always said that David Brown wrote those. He must have also written the sub-title for this article — “Bride or matron, this will teach you more about the desires of the human male than the Kinsey report. Recommended reading – and eating – for all. 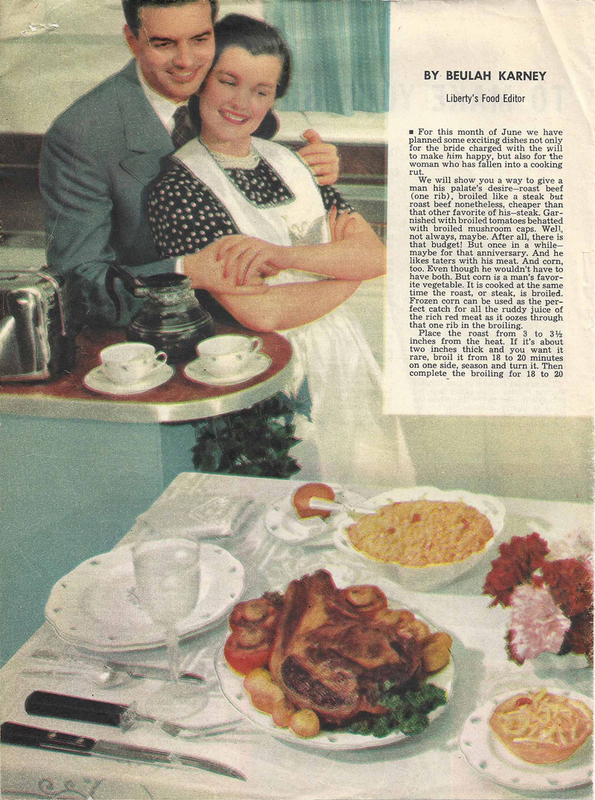 This feature includes instructions for roasting a bit of meat for your man, directions for a fresh fruit salad (presentation is key here) and fresh hot yeast muffins (so he can smell hot bread when he comes in from a hard day’s work. What a different perspective from her Holden Enterprise days and her column titled Food My Husband Does Not Like! Enjoy. Crumble 1 package yeast (compressed or dry granulated) in 1/4 cup lukewarm water to soften. Scald 1/4 cup milk; cool. Beat 2 eggs in mixing bowl. Add 1/4 cup sugar, 1 tsp salt, 1/4 cup melted shortening, 1 tablespoon grated orange rind. Mix Well. Add cooled milk and 1 cup sifted flour. Beat smooth. Add softened yeast. Mix well. Add another 1 1/4 cup sifted flour. Beat 2 minutes. Fill greased muffin pans half full. Let rise in warm place until doubled (about 45 minutes). Bake in moderate oven (375 degrees) 18 to 20 minutes. Serve hot. Makes 1 dozen three-inch muffins.